Gertrude Margaret Lowthian Bell was born into a wealthy family at Washington New Hall in County Durham, as it was then. From the beginning of the 19th century, Gertrude developed an interest of the Arab peoples and cultures. She strove to learn their languages, investigated their archaeological sites and travelled deep into their lands and desert. She became an expert of the part of the world, spending a substantial amount of time there before, during and after the First World War. This made her the ideal candidate to be working for British Intelligence during the War. 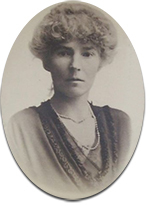 Gertrude left a huge archive of books, photographs, diaries and personal letters that are now part of Gertrude Bell’s Collection at Newcastle University.